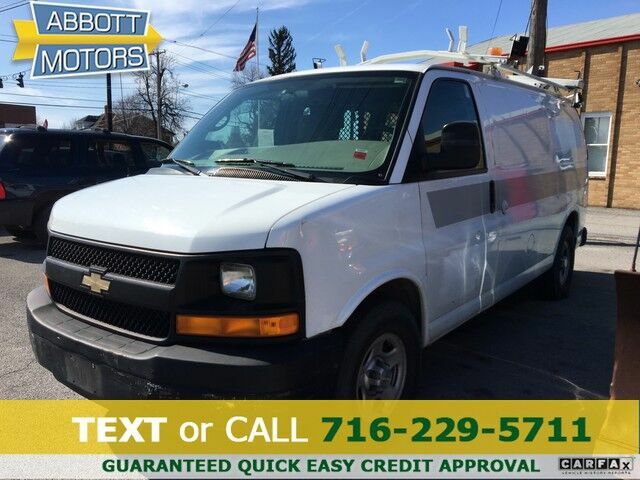 ABBOTT MOTORS, An exceptional car buying Experience, is offering this extremely low mileage Chevrolet Express Cargo Van for sale. ABBOTT MOTORS has over 50 years of automotive experience! We are also a CARFAX Advantage Dealer. We offer great deals and specialize in FINANCING FOR EVERYONE-ALL CREDIT APPS ACCEPTED! We look forward to helping you purchase your next vehicle. CALL or TEXT (716) 229-5711 for quick answers to your questions about this vehicle. Your message will be answered by a real human never an automated system This 2007 Chevrolet Express Cargo Van comes with a CARFAX Buyback Guarantee, which means you can buy with certainty. A test drive can only tell you so much. Get all the info when you purchase a vehicle like this with a CARFAX one-owner report. This Express Cargo Van w/Low Miles has been lightly driven and there is little to no wear and tear on this vehicle. The care taken on this gently used vehicle is reflective of the 24,455mi put on this Chevrolet. Looking for a Chevrolet Express Cargo Van that is in great condition inside and out? Take a look at this beauty. This Chevrolet Express Cargo Van was well-kept and regularly serviced, which is evident by the amazing condition of its paint. This is rare find these days to find one with such low miles. STOP IN TODAY or Apply Online 24/7 at Abbottmotors.com ... All Trade-ins Welcome... Same Day Delivery... Call or Text Today and See The Difference... We Look Forward to Serving You! !This vehicle may be subject to potential open recall(s). Vehicle recall information may be found at Safecar.gov. Please verify price, equipment, options and features with your sales rep before your purchase. We Look Forward to Serving You. *Tax, title, plates extra. All Financing On Approved Credit. BBB accredited A+ member.